Bari-Fit – Ditch Dieting One Habit at a Time! Helping You to Ditch Dieting One Habit at a Time! Get access to my full catalog of healthy, delicious bariatric recipes with full nutrition details. Create your own meal plans with access to my exclusive recipe meal planner, and grocery list builder. Download effective workout programs designed to minimize loose skin, maintain muscle and give you that beautiful body! Enjoy exclusive member only challenges and discounts. And the best part…message Tosha anytime! All the essential resources you need to maintain a healthy lifestyle! Learn the key to losing weight by eating real foods! Join my private Bariatric Habits Facebook support group today! Shop my high quality vitamins and minerals that are made in the USA! Schedule your 30 minute consultation with me today! It’s a mess out there, isn’t it? With fad diets, hard-to-follow nutrition information, and a flashy new app every week, the nutrition and fitness world can be a confusing place. It’s no wonder that most people have a hard time losing weight and getting in shape? Instead of the all-or-nothing dieting approach, I use a sustainable, practice-based philosophy to build healthy habits into your life, one day at a time. The result? You’ll lose the weight (and inches) you haven’t been able to shed for years. You’ll develop a better relationship with food. And you’ll say goodbye to dieting, food obsessions, and body anxieties forever! Coaching is for anyone that wants to improve their health, get the body they have always wanted and say goodbye to dieting forever. Over the past 4 years, I have helped hundreds of men and woman get into their best shape ever and stay that way for good! Lasting body TRANSFORMATIONS like these don’t come from dieting. They come from proven, research-driven methods that continue to work with men and women of all shapes, sizes, and lifestyles. And they happen when you have a world-class coach in your corner to keep you on track and guide you step-by-step toward total body transformation. What if you could have someone motivate, encourage, and inspire you to become the very best version of you! I will work one-on-one with you to develop a personalized program centered around your daily lifestyle. It will get you started in the right direction and help you learn a new way of life that best suits your needs. This is is not another fad diet filled with unobtainable goals. This program is centered on equipping you for a lifestyle change! I start with you — your life, needs, and goals. Then, together, we develop a personalized plan to help you eat, move, and live better — in a way that fits into your real, everyday life. Instead of another complex diet program to follow, get ready to have one less thing to worry about. I will sweat the details so you can breathe easily and focus only on the next step in front of you. Lose weight, build strength, have more energy. Whatever your goals, I will help you get there. Enjoy eating real foods and maintaining a balanced lifestyle with little product supplementation. Cutting calories too much and banishing entire food groups may cause a deficiency in vitamins, minerals, essential fatty acids, and/or fiber. You do not have to do this alone! Support is a major key to motivation and long-term success. I will give you accountability, direction, and support every step of the way and help you stay consistent, no matter what life throws at you. You’ll be able to reach out to me anytime through the online coaching platform, with options to connect by phone, text, or video chat. I regularly review your progress, offer insights, and check in with you to provide support and guidance. The only way you will get lean and stay lean is to choose new behaviors, develop new habits, and maintain them for life. Join my tribe today and have access to all the essential resources you need to maintain your weigh-loss for life! Become a lifetime member to unlock these amazing benefits. Feel like your body is working against you? Learn how to stop dieting and start feeling better immediately. As your body changes, your needs change. And so your nutrition and fitness plan must change too. There’s only one way to continue to get results, and that’s to tailor your diet specifically to your body, your goals and the results you want! Work with me one-to-one on your specific body composition goals, nutritional needs and habits. 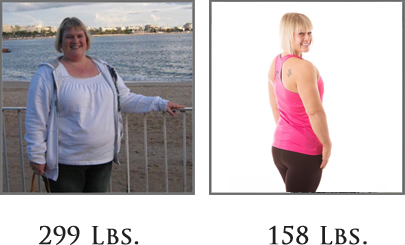 After bariatric surgery in 2013, I felt lost during the weight-loss process. There was so much conflicting information out there and following it got me nutritionally deprived. I wish there was one bariatric place I could have went to for sound nutrition and fitness advice…but NOTHING like that existed. Many can relate to feeling lost during their weight-loss journey; this is why I recognized the need for the right guidance and created Bari-Fit!